When I arrived in North Carolina, almost 15 days after the initial disaster, all immediate triage and placement of disaster victims into shelters had already taken place. Hurricane Matthew had hit the region on Oct. 8, and a student in the RN-BSN program in Sonoma State University's Nursing Department, I felt the urge to come out and help in any way I could. A state of emergency was declared on Oct. 10 after the category 3 hurricane with wind speeds reaching 91 mph devastated parts of the state. I responded to a national American Red Cross request for help, and though I had volunteered to help the Red Cross in the past this was the first time I received a call back. My assignment would be to meet up with the Emergency Response Vehicle and to reach out to the residents affected by the disaster. Thanks to the mostly online hybrid format of the Post-Licensure BSN Program at Sonoma State, I was able to check and complete schoolwork online while I was in North Carolina. This allowed me to continue my education and keep on track to graduate in May this year. The RN-BSN program gives registered nurses like myself a pathway to complete a Bachelor of Science in nursing using credit for previous coursework and with a flexible schedule. 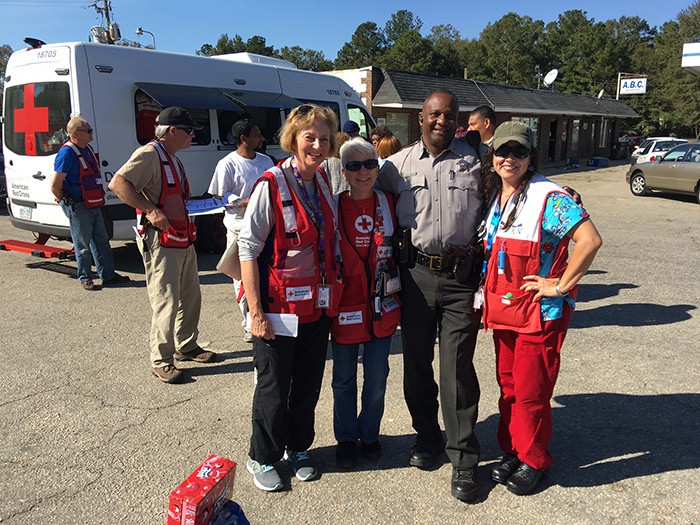 One day after arriving at the Raleigh airport, I drove 100 miles to the Red Cross relief headquarters and was assigned to a group with three other nurse volunteers. We entered a church auditorium that had rows of cots and personal belongings. There were over 100 cots set up and I was instructed to grab a towel, a set of sheets and a blanket. After unloading and setting up my sleep area, we drove back to headquarters for our assignment. We were making sure people knew about the Emergency Response Vehicle, which served 150-300 meals a day, and about shelters and other available resources. Neighborhood after neighborhood and town after town, I saw a similar scene of two rows of belongings piled high on both sides of the street as far down as I could see, all ruined by water. We stopped and handed out snacks, water, gloves and masks, and made sure people had their essential needs met. Some people had lost eyeglasses, walkers and even a set of dentures in the floods from the hurricane. If it was a disaster-related loss, the Red Cross could help to replace items, and if not a direct loss due to flooding, we would coach the resident on how to locate and utilize resources in their area. There was opportunity every day to use the public health education I was learning at Sonoma State. It felt good to be able to help people locate resources, coach patients on the importance of maintaining a personal health record and empower them to fulfill their needs. What we encountered over and over was people's need to tell their story. It was clear that so many needed to say what happened to them, the losses they had suffered and their feelings surrounding their loss. A majority of what I did while deployed was to offer psychological first aid by just listening. One day we visited a shelter to deliver some supplies and the biggest difference I made there was giving a group of seven children a few minutes of my time. Playing and dancing with those children for that 10 minutes lifted their tiny spirits and they were joyful. I will never forget their faces lighting up, the next one more excited than the last, holding his hand up to get his turn to be spun around while we were all dancing. Volunteering and helping others when we can is an important aspect of being human. I am grateful that I was able to go and make a difference. As a nurse, the desire to help others is a driving force in my chosen profession; as a human, the desire to help others is ever present in my life, and this was soul food for me. I hope this trip was the first of many to come. Sonoma State University announced two actions Tuesday that underscore President Judy K. Sakaki's ongoing commitment to diversity and student success.